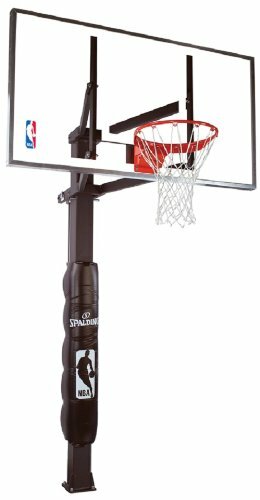 The Spalding 88454G is an in ground basketball hoop system that features a 54 inch backboard, 2-piece 4 inch square pole, ground sleeve anchor system, U-Turn Pro adjustment mechanism, and Pro-image breakaway rim. Installation is a bit tricky for this hoop. The instructions are somewhat misleading and there have been cases that the manual states instructions/parts that are non-existent in the package. Best advice is to read the whole thing first before doing anything to get a clear understanding and so you can plan your steps for a smooth installation. As with all in ground hoop systems, pouring concrete and assembling the pole would take a few hours. The curing of the cement should be about 2 days and then you can install the hoop. For the backboard, about 2 adults could install this thing without a hitch, another helping hand would be great. With the U-Turn Pro Lift, adjusting the height is a breeze. Height can be adjusted between 7.5 feet and 10 feet. There’s also an option to remove the adjustment pole after reaching your desired height. However, to continue experiencing easy adjustment, the mechanism must be maintained/lubricated from time to time. As per usual with Spalding, the 88454G is high grade quality. The poles and backboard are quite sturdy and the pro-Image rim can certainly take some punishment. However, there is some shaking and wobbling when hitting the backboard, especially with hard shots. There’s an option to use a sleeve on assembly so that you could move your in ground hoop if you have to. The Spalding 88454G In Ground Basketball Hoop System is not the best offering by Spalding, but it is certainly not the worst either. But with the company’s reputation for putting out quality goals, with this model being another one, and the overall quality of this hoop, it is still worth looking at, as the pros really outweigh cons. If you are looking for a hoop system that is durable yet affordable, take a look at the Spalding 8454G.